Jumeau was a French company, founded in the early 1840s, which designed and manufactured high quality bisque dolls. It was founded by Louis-Desire Belton and Pierre-François Jumeau in the Maison Jumeau of Montreuil-sous-Bois, near Paris, France. While Belton did not remain with the company for long, under Jumeau’s leadership (and later, under the leadership of his son, Emile), the company soon gained a reputation for dolls with beautiful faces and “exquisite” clothing which replicated the popular fashions of the time. 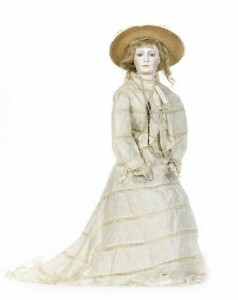 Pictured: French Bisque Bebe Triste, Size 14, Emile Jumeau with Original Couturier Costume c1867 – 26″ (66 cm.) Bisque swivel head on kid-edged bisque shoulder plate, perfectly oval-shaped face with appealing plumpness to lower chin, small blue glass enamel inset eyes with darker blue outer rims, dark eyeliner, painted lashes, mauve-blushed eye shadow, feathered brows, shaded nostrils of aquiline nose, closed mouth with well-defined lips enhanced by accent lines, pierced ears pierced into head, blonde mohair wig over cork pate, kid body with shapely torso, gusset-jointed arms, stitch-jointed legs, ice-blue silk antique gown, undergarments, blue kidskin ankle boots, bonnet. Condition: generally excellent, body sturdy and clean. Comments: Pierre-Francois Jumeau, circa 1867, the portrait-like model was likely created for exhibition at the Paris 1867 International Exposition. Doll from The Billie & Paige Welker Collection Image Copyright Theriaults. The Jumeau company first emerged as a partnership between Louis-Desire Belton and Pierre-François Jumeau in Paris in the early 1840s. In 1844, Belton and Jumeau presented their dolls at the Paris Exposition (at which they received an honorable mention), but by 1846 Belton’s name was no longer associated with the dolls, and Jumeau was trading in his own right. A bronze medal in the 1849 Paris Exposition followed, as did an appearance at the Great Exhibition in London in 1851, at which the company was awarded a First Place Medal. Through much of this period, the firm sold only their own dolls to wholesalers, although during the 1850s and 1860s, the company moved into selling wax dolls imported from Britain. 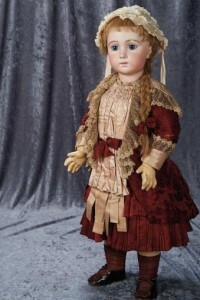 Pictured: French Bisque Bebe Triste, Size 14, Emile Jumeau with Original Couturier Costume – 30″ (76 cm.) Bisque socket head with very full cheeks and chin, large blue glass paperweight inset eyes with heavy upper eyelids, dark eyeliner, painted lashes, mauve-blushed eye shadow, brush-stroked and feathered brows with decorative glaze, shaded nostrils, closed mouth with outlined and accented lips, dimpled chin, separately modeled pierced ears, blonde human hair over cork pate, French composition and wooden fully jointed plump body with straight wrists. Condition: generally excellent. Marks: 14 (head) Jumeau Medaille d’Or Paris (body). Comments: Emile Jumeau, the wistful-faced Bebe Triste, circa 1884. Doll from The Billie & Paige Welker Collection Image Copyright Theriaults. At the Paris expositions and the Great Exhibition in London, Jumeau dolls received their commendations due largely to the quality of the clothing, and no special significance was attached to the dolls themselves. This changed in 1867, when at the Exposition Universelle of that year, the company was awarded a Silver Medal, and “special mention was made of the doll’s heads”. 1867 was also the year that Pierre-François’ son, Emile Jumeau, joined the company. By 1873, when they were awarded a gold medal at the Vienna Exposition, the company was producing their own bisque dolls in their factory in Montreuil. Pictured: Extremely rare and large Pierre Francois portrait Jumeau bisque shoulder head fashion doll – Having the features of a character lady, fixed blue glass eyes, with delicate shading to lids, closed slightly smiling mouth, moulded pierced ears and long blonde mohair wig, swivel head to kid leather body with separate fingers, wearing ivory silk and lace two piece gown, under garments, lace up boots and straw bonnet, 66cm (26in) tall. Image Copyright Bonhams. Although the Jumeau firm had won commendations, very few Jumeau dolls can be securely identified dating before the 1870s. However, by 1877 Emile Jumeau had produced the first Bébés (or dolls in the image of a little girl). 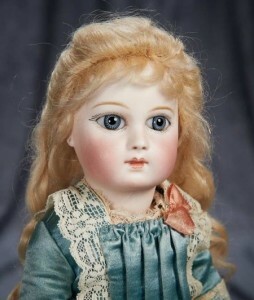 With realistic glass eyes and “stylish fashions” produced by costumiers, thousands of Bébé dolls were produced for an international market. Pictured: French Bisque Portrait Bebe by Emile Jumeau – 12″ (30 cm.) Pressed bisque socket head, large grey/blue glass inset eyes known as “wrap-around” with spiral threading and pronounced black pupils, painted lashes, dark eyeliner, rose-blushed eye shadow, feathered brows, accented nostrils and eye corners, closed mouth, outlined lips, pierced ears, blonde mohair wig over cork pate, French composition and wooden eight-loose-ball-jointed body with straight wrists, pretty antique aqua silk costume, undergarments, leather slippers. Condition: generally excellent. Marks: 8/0 (head) Jumeau Medaille d’Or Paris (body). Comments: Emile Jumeau, circa 1878. Doll from The Billie & Paige Welker Collection Image Copyright Theriaults. 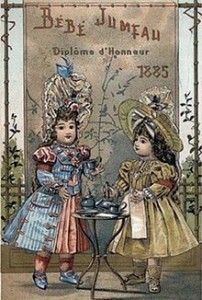 In 1878, the Jumeau company won a Gold Medal at the Exposition Universelle (1878). The award was proudly advertised on the bodies, boxes, shoes and even the dress labels of the dolls. 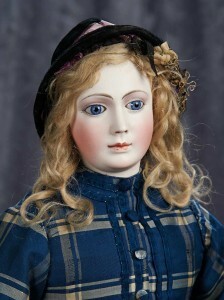 Jumeau won a number of other high awards including the prizes for the best dollmaker at both the Sydney International Exhibition (1879) and Melbourne International Exhibition (1880) in Australia. The dolls were internationally sought after as luxury items and status symbols. The firm also was regarded as an industrial success, with production figures of over three million dolls annually by the mid-1890s. The “Golden Age” of the Jumeau factory lasted for two decades, from the late 1870s to the late 1890s, when the competition from German dolls sent the firm into financial difficulties. The Jumeau dolls from the later 1890s are of more variable quality. German dolls in the 1890s were cheaper than the French, but still well-made and much loved by little girls, even if they were by no means as elegant or graceful in face or costume as the best Jumeau dolls.